April 27, 2015, 12:10 p.m.
By Joseph Lichterman @ylichterman April 27, 2015, 12:10 p.m.
Esquire first published Gay Talese’s iconic profile of Joe DiMaggio in its July 1966 issue. The piece was “an evocative portrait of a great ballplayer long after his last game is over, and we have a powerful sense of his loneliness and his essential separation from almost everyone around him,” David Halberstam wrote in his foreword to The Best American Sports Writing of the Century, a collection he edited and in which he named Talese’s profile one of the four best sports stories of the 20th Century. 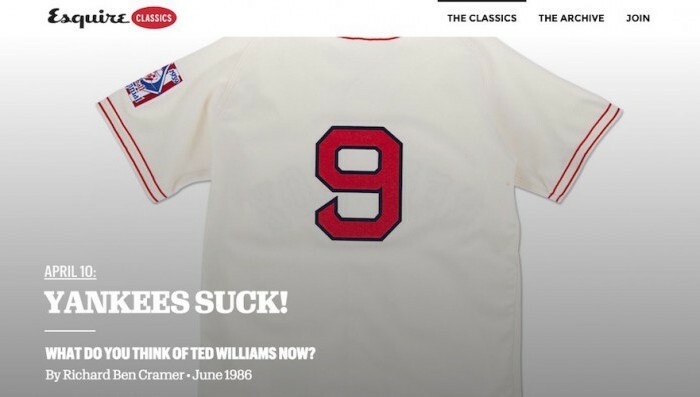 In fact, three of those four stories were originally published in Esquire — a testament to its legacy, as Halberstam wrote, as “the most exciting magazine in the country.” Another was the late Richard Ben Cramer’s 1986 profile of Ted Williams, in which Cramer managed to secure unique access to the reclusive Red Sox great. Together, the two Esquire stories paint remarkable portraits of two of baseball’s all-time best players and fiercest rivals. So this month, when the Red Sox and Yankees prepared to meet for the first time this season, Esquire republished both stories together on Esquire Classics, a new website from Esquire that resurfaces some of the magazine’s best archival material with modern introductions and fresh artwork. The standalone website launched in late March, with a twist: The full text of each story published on Esquire Classics is also sent out in a weekly email — the latest evidence that people’s inboxes are gaining appeal as a publishing platform. The stories are meant to relate to anniversaries or other events in the news. There was an August 1968 article on the assassination of Martin Luther King Jr. that coincided with the anniversary of his death on April 4. It also republished a 1968 profile of Elvis timed to the debut of The Elvis Experience in Las Vegas. “We’re continuing our experiments with seeing what kinds of great archival stories people want to read and what formats seem to be most popular,” senior features editor Tyler Cabot, who leads Esquire Labs and is also a former Nieman fellow, told me in an email. With a roster of contributors dating back to 1933 that includes Talese, Ernest Hemingway, F. Scott Fitzgerald, Nora Ephron, and dozens of other notable writers, Esquire is well-suited to resurface stories from its archive. Gawker Media’s Deadspin has The Stacks, which republishes classic sports journalism originally published elsewhere. 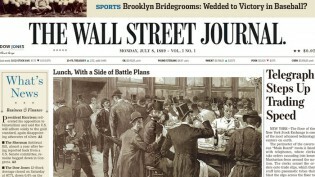 For its 125th anniversary last year, The Wall Street Journal published more than 300 archival articles. 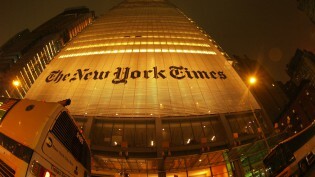 The New York Times runs a Twitter account, NYT Archives, that resurfaces archival content from the Times. It also runs First Glimpses, a series that examines the first time famous people or concepts appeared in the paper. Esquire Classics was built and is being edited by Aleszu Bajak, who teaches journalism at Northeastern University’s Media Innovation Program and previously partnered with Esquire as part of Story Lab, a course that reimagines how Esquire features are presented digitally. Esquire has done little to promote the launch of Esquire Classics aside from targeted emails like Granger’s and a handful of social media posts. As of this writing, it has 205 followers on Twitter and 43 Facebook likes. Cabot also wouldn’t go into specifics about the site or discuss Esquire’s plans for it, but there’s an archive section on the site promoting the Esquire Cover to Cover Archive featuring “Every issue. Every story. From 1933 to Forever” that it says is “coming soon.” And as of now, the site is free and there aren’t any ads running on it. So while it remains to be seen how exactly Esquire will grow Esquire Classics, it’s likely we’ll see more pre-web publications take advantage of their archives as they continue to look for new ways to engage readers and draw traffic online. POSTED April 27, 2015, 12:10 p.m.
Lichterman, Joseph. "Esquire has a cold: How the magazine is mining its archives with the launch of Esquire Classics." Nieman Journalism Lab. Nieman Foundation for Journalism at Harvard, 27 Apr. 2015. Web. 25 Apr. 2019. Lichterman, Joseph. "Esquire has a cold: How the magazine is mining its archives with the launch of Esquire Classics." Nieman Journalism Lab. Last modified April 27, 2015. 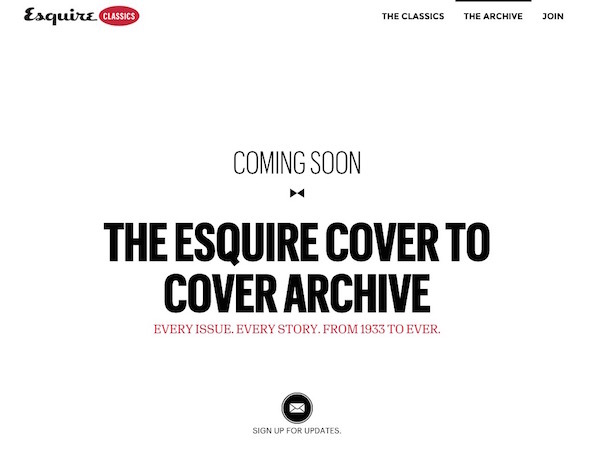 Accessed April 25, 2019. https://www.niemanlab.org/2015/04/esquire-has-a-cold-how-the-magazine-is-mining-its-archives-with-the-launch-of-esquire-classics/.